← Do we know David Sweat is alive? Well. Who can blame him? Our thought is reporters need to stop quoting authorities releasing press statements, and start digging around themselves. Real update: David Sweat is now in custody and suffering from gunshot wounds. Not self-inflicted. Buffalo News (thanks Moms Hugs) reports that Sweat is bleeding badly from two gunshot wounds. Sweat was not packing. and spotted walking down the street in Constable, – just outside search area. Prediction: Joyce Mitchell’s really bad day will continue; and her husband might want to consider hiring a divorce attorney. Future Lessons: When planning a prison break, if you have short hair; grow it out beforehand. This entry was posted in David Sweat, Government, Journalism, Law. Bookmark the permalink. 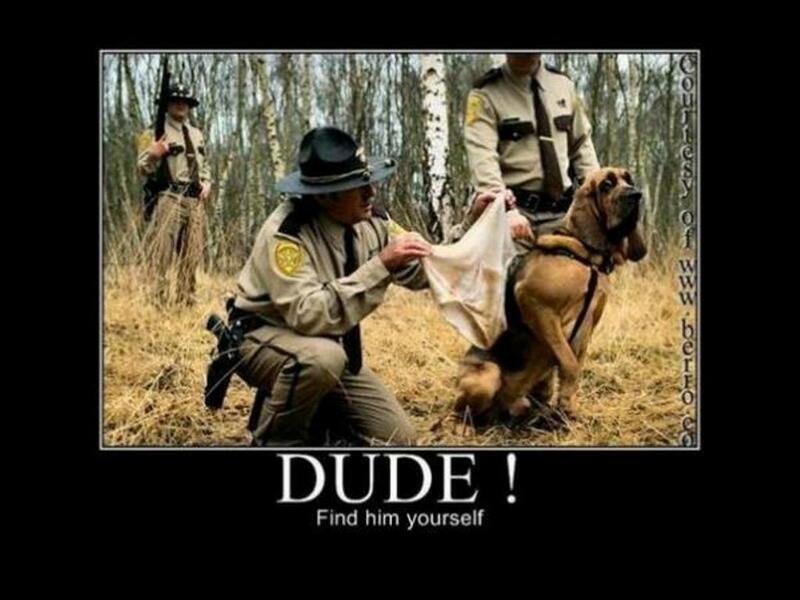 LOVE that bloodhound photo – too funny! Well I’m wrong again! They shot/wounded Sweat getting ready to cross the border. According to Reuters quoting the Buffalo News: Sweat is bleeding badly from “life-threatening” wounds & has been airlifted to Albany. NY prison authorities wanted him captured alive to learn more about how they escaped to tighten prison security. Not to worry. I thought him might have been killed by co-escapee!